And the story doesn't end when the loved one dies -- no, that's only Act I. There are yet the loved one's affairs to sort out, the family feuds over money, and the caregivers themselves who gave up everything now left with nothing -- often no income, no place to go. Emma, my mother, was a sweet, beautiful woman, an accomplished water colorist and pianist, who loved entertaining, travel and raising her toy poodles, until one day she laid down her half-finished sketch, slipped into dementia and I fell backwards into becoming her sole caregiver. She died on April 11, 2012 at 97. 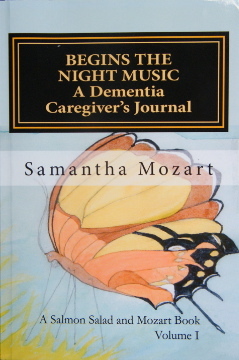 I have just published a book, “Begins the Night Music: A Dementia Caregiver’s Journal, Volume I”, available on Amazon.com, Barnes & Noble and worldwide. Emma and Samantha are not our real names; I use them to protect my mother’s dignity and respect. I am author of newspaper and magazine feature stories, essays, and served as editor of a community newspaper. For the last decade I served as sole, unpaid caregiver for my mother, watching her slowly slip away during her gradual decline from dementia. There was no one else to care for her; I had no family support and gave up everything I had, my belongings, my life as I knew it to care for Emma. And the story doesn’t end when the loved one dies — no, that’s only Act I. There are yet the loved one’s affairs to sort out, the family feuds over money, and the caregivers themselves who gave up everything now left with nothing — often no income, no place to go.